Workers in the Public Safety department of the West Rand District Municipality, Gauteng, are experiencing extremely stressful times. This is mainly due to management’s actions. There have been many cases of resignations and stress-related illnesses – and some workers have been affected badly enough to commit suicide. Management has continually turned a blind eye to the problems. It is a major employer, as the municipality is a large one, covering mining areas like Carletonville, Khutsong, Krudersdorp, Randfontein and Westdriefontein and rural areas like Magaliesberg and Muldersdrift. The problems started in June 2013 when employees’ salaries were unilaterally cut. The South African Municipal Workers Union (SAMWU) and the Independent Municipal and Allied Trade Union (IMATU) demanded explanations. The municipality claimed workers were being paid incorrect amounts for working on Sundays and public holidays. In terms of labour law, workers must be paid at time-and-a-half for working Sundays and double-time for working public holidays. Management agreed, but claimed that the formula it used to calculate the extra pay was incorrect – and so, was overpaying. The “error” was news to unions, which noted payment practices had not changed for almost 20 years. Further, municipal bosses had never previously mentioned any such “error” – not even during the tense merger processes in which workers from different local municipalities were merged into the District Municipality. Organised labour felt it unfair to unilaterally cut salaries: the error was on the part of management, but workers paid the price. The unions arranged a protected strike and a settlement with management was eventually reached through mediation. This included putting a new shift system in place by 1 April 2014, consultations between management and unions over implementation and ironing out how workers were going to be paid. Shift workers, who work a 12 hour shift, wanted the details consulted and in writing. Since the settlement, municipal management has completely ignored the consultative process and unilaterally implemented a new shift system. This has meant cuts in employees’ pay. 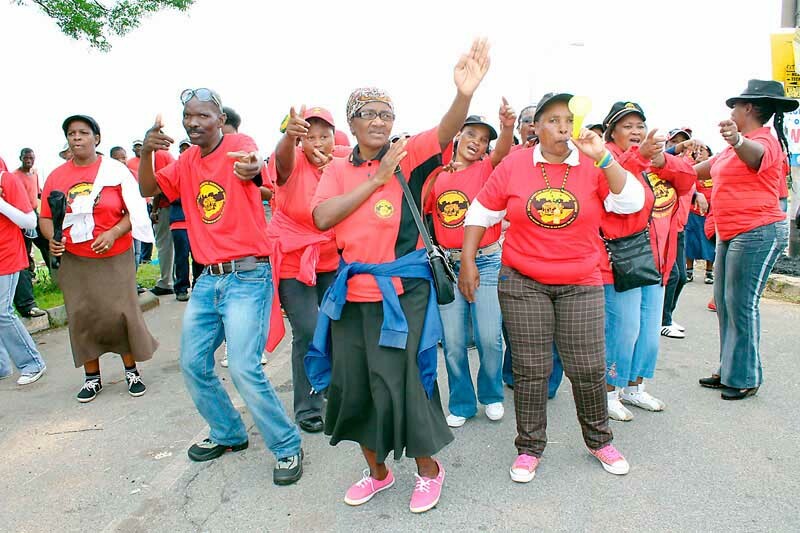 SAMWU and IMATU have tried on many occasions to talk to management regarding these issues. However, no solutions have been found as management continues to insist that they are right in what they have done. Again, we have a stand-off. The working class won’t back down on its rightful demands, but the political elite refuses to compromise. As in the Post Office and on the mines, agreements are ignored by the powerful. ‹ PreviousWorking Class Livelihoods: Struggle against Each Other, or Revolt against the System?